In this trail we stop off at two airfields, where we find some remarkable relics and some terrible stories. Our first stop is at a site that is little known about even though it played a major part in the night-fighter air war, and was the proving ground for some of the world’s top motor racing drivers as well. Yet beneath all this glamour and bravado it holds a collection of terrible stories. We stop off at the former RAF Charterhall. Located some 15 miles south-west of the coastal town of Berwick, Charterhall airfield had its aviation origins in the First World War. Its original name was RFC Eccles Tofts (although the two were not quite the same physical site), a landing ground for 77 Squadron who were based further north at Edinburgh, and flew the Royal Aircraft Factory BE.2c/d/e, BE.12, RE8, de Havilland DH6 and Avro’s 504k. Whilst not official detached here, the airfield was available for these aircraft to land upon and be recovered should the need arise. It wasn’t kept open for long and soon disappeared returning to its former agricultural use. Charterhall is one of those airfields that has a grand sounding name, suggesting regency and nobility, its reality though, was somewhat different. It gained the rather unsavoury, but apt, nick-name ‘Slaughterhall’, due to the high accident rate of the trainee aircrew who passed through here. Many of the aircraft that operated from here were outdated and ‘war weary’, held together by the dedicated mechanics that took great pride in their work. Used for short-term placements of trainees, it would not house any true front line squadrons until the war’s end in 1945. As a training airfield it would have a large number of airfield buildings, two Tarmacadam (Tarmac) runways the main running east-west of 1,600 yards and the second north-east/south-west of 1,100 yards; both were the standard 50 yards wide. There were some 38 dispersal pans, similar in shape to the ‘frying pan’ style , eight blister hangars and four main hangars of which two still survive. 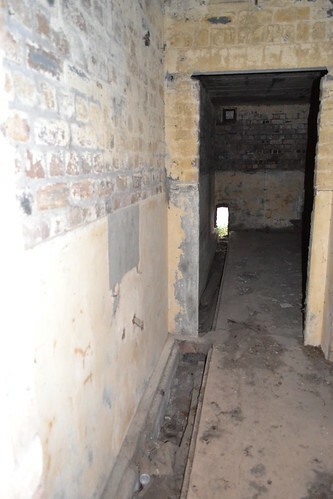 Charterhall’s accommodation was initially designed for 1,392 airmen and 464 WAAFs – consisting of 126 Officers (both male and female) and 1,730 other ranks (again both male and female). The main technical area was to the north side of the airfield with accommodation spread amongst the woods around this area. The watch office, long since demolished, was a mix of concrete and timber (thought to be initially a 518/40 design), which originally had timber floors, roof and stairs. However, an acute shortage of wood led to all these designs having only a timber balcony and control room. These modified designs (Charterhall included) were therefore built to a mix of 518/40 and 8936/40 specifications. Another interesting feature of Charterhall would have been the instructional fuselage building. Here crews would have been trained using an aircraft fuselage (Charterhall had two, one each of Beaufighter and Blenheim) jacked up and linked to a controller’s panel. A number of simulated problems could be created for the crews to experience, anything from radio exercises through small warning lights to engine failure and even ditching. All crewmen had to have a good understanding of their aircraft, working hydraulics, electrical and fuel systems were all taught using this same method. In addition to these training fuselages, Charterhall would operate six Link Trainers, along with several other ‘state of the art’ training facilities. Many of the remaining buildings are in a poor state of repair. The entire airfield would occupy around 143 hectares, it was certainly not large, especially considering the numbers of crews and mix of aircraft it would have during its short life. Construction of Charterhall took place over 1941/42 opening on April 30th as part of 81 Group Fighter Command (and later 9 Group), receiving 54 Operational Training Unit (O.T.U) in May 1942. Formed two years earlier, they flew primarily Blenheim Is and Beaufighter IIs under the Squadron code ‘BF’ (Four different unit codes were used: BF, LX, ST and YX). A number of these aircraft were fitted with Aircraft Interception radar (AI) and some Blenheims were dual control. 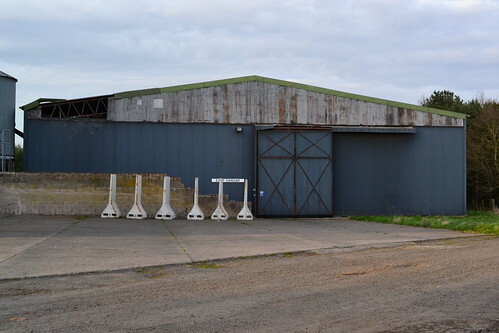 To support the operations at Charterhall, a satellite airfield was built at nearby Winfield, a few miles east, both sites being used by 54 O.T.U. simultaneously. Later in the war, in an effort to divert marauding Luftwaffe bombers away from the two airfields, a dummy ‘Q’ site (No. 179) was built at Swinton also to the east of Charterhall. Many of the crews arriving at Charterhall were brought in from around the Commonwealth and after passing their basic flying training instruction, would proceed through a further three stages of training. Some crews were also ex-fighter pilots already battled hardened, who had transferred in from front line units to night-fighters. Progression through the course would be through initially three, and latterly four, squadrons. ‘A’ Squadron would be the initial conversion unit initiating crews on the rudiments of twin-engined aircraft as many had come from single engined fighter units. ‘B’ Squadron was the intermediate squadron, where the crews moved onto the larger twin-engined aircraft and finally ‘C’, (based at Winfield) was the advanced squadron honing skills such as aircraft interception and attack. After completing the full training period, crews would receive postings to front line squadrons across the U.K. and beyond. A latrine on the technical site. Initially on opening, Charterhall was not completely ready, especially the airfield’s lighting (Drem), and so training flights would only occur during the day. But, with the help of ground crews, this was soon rectified and by the end of the month considerable work had been done, and very soon night flying could begin. The first daylight flights took place on May 13th 1942, followed by night flying seven days later, and – as crews were to find out very quickly – flying these aircraft would be a risky business. During 1942 some 5000 aircrew would enter 81 Group’s training units, and they would suffer in the region of 2,000 accidents, of which just under 200 would be fatal. On May 23rd, 54 O.T.U’s first accident would occur when a ‘technical failure’ on a Blenheim Mk I, would cause the controls to jam. The aircrew were thankfully unhurt but the aircraft was severely damaged in the resultant crash. The first fatality would not be long in coming though, occurring just two days later, on May 25th, less than a month after 54 O.T.U’s arrival. On this day, Blenheim IV (Z6090) crashed killing both Pilot Officer J. A. Hill (s/n 115324) and Observer Sgt. A.E. Harrison (s/n 1384501) in an accident which is thought to have been caused by icing. P/O Hill is buried at Haddington (St. Martin’s) burial ground in East Lothain, whilst Sgt Harrison is buried in Middlesbrough (Acklam) Cemetery, Yorkshire. During June, the first Beaufighters would begin to arrive, followed quickly by their first accident. Whilst on delivery by 2 Aircraft Delivery Flight at Colerne, the aircraft – a Beaufighter MkIIf – had an engine cut out causing it to crash about 10 kilometres north-west of Charterhall. Luckily the crew were able to walk away but the aircraft was written off. During July bad weather hampered flying activities, but it didn’t prevent the unit from increasing its strength to seventy-seven aircraft. Primarily Blenheims and Beaufighters, there were also a small number of Lysanders for target towing and four Airspeed Oxfords. Accidents continued to occur at Charterhall, and it wasn’t until September 1942 that it would be fatality free – a welcome boost to the morale of the instructors at the time. However, the reprieve was short-lived, and October would see further accidents and yet more fatalities. 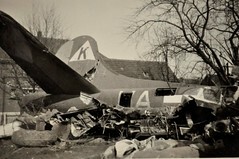 On the 5th, two Blenheim MK Is (L6788 and L8613) collided: Pilot Sgt. J. Masters (missing – presumed drowned) and Navigator Sgt. J. Gracey were both killed. There were seven other accidents that month, a tally that involved two Blenheims and five Beaufighters, with the loss of one life. Causes included: two burst tyres, two overshoots, a loss of control and an undercarriage failure, all of which added to the lengthening list of accidents occurring at Charterhall. The need for new crews increased the pressure on training stations to increase flying hours. Courses were cut short, spares were lacking and with only rudimentary rescue equipment, further deaths were inevitable. As a result, it wouldn’t be until March 1943 before Charterhall would see a break in these increasing fatalities. The start of 1943 saw a new Station Commander, but the new change in command would not see the new year start on a good note. During the Battle of Britain many pilots suffered from burns in aircraft fires and crashes. The famous ‘Guinea Pig club’ became synonymous with those men who underwent experimental techniques in reconstructive skin work carried out by of Archibald McIndoe at the Queen Victoria Hospital, East Grinstead in Sussex. Some of these men wrote about their experiences, and one, Flight Lieutenant Richard Hillary, sadly lost his life at Charterhall. Hillary arrived here in November 1942 – after two long years of surgery and hospitalisation. Writing about his experiences in ‘The Last Enemy‘ he opted for night fighter training and was posted to Charterhall. Still disfigured, he had virtually no experience in night flying and none on twin-engined aircraft. One of two remaining hangars. In April 1943 Beauforts began arriving to replace the ageing and very much outdated Blenheim Is. It was also in this month that responsibility of the O.T.Us passed over to 9 Group, and there were now fourteen operational units countrywide. Monthly ‘processing’ of new crews would be increased to an intake of 40 all undertaking a 12 week course before finally being posted to operational squadrons. A further incident, also caused by a Beaufighter swinging on take off, caused the first July fatality, when the aircraft hit both a blister hangar and a taxiing Beaufort. The two collisions wrote off the Beaufighter and severely damaged the Beaufort. The pilot of the Beaufighter, Flight Sgt. W. Andrew (s/n 415280) aged just 21, was killed in the incident. July was a milestone for 54 O.T.U in that it was the first time that 3,000 flying hours had been exceeded of which 894 had been carried out at night at a cost of 20 accidents – such was the demand for trained operational crews. During September, new MK VI Beaufighters began to arrive. These were passed directly to Winfield and ‘C’ squadron after delivery and inspection at Charterhall. Even though they were ‘factory new’, they did not prevent further accidents nor deaths occurring. By the end of 1943, 54 O.T.U had amassed 28,940 hours flying time of which 7,012 were at night. A huge total that had enabled the RAF to pass the equivalent of 12 operational squadron crews but it had also taken a serious loss of life. In January 1944 the unit strength was up to ninety-six aircraft, flying continued where the inclement weather allowed, and the year would start off with no serious accidents or deaths – a welcome break; but 1944 would eventually prove to be Charterhall’s worst year. May brought a new focus for the trainees when it was decided to make 54 O.T.U operational in support of the impending invasion. Operating in the night fighter role, they were called out on to intercept German aircraft roaming over the north-east of England and southern Scotland. Unfortunately, whilst intruders were detected, no contacts were made during these operations, primarily due to the intruders flying too low for the GCI to pick them up; but it did give some purpose to the heavy losses that were being incurred. At this time a new aircraft began appearing in ‘C’ Squadron, a model that gave new hope and determination to the crews – the incredible, D.H. Mosquito. By the war’s end, 54 O.T.U. would have used eight different variants of the Mosquito. The initial batch of two were located at Winfield, rather disappointing perhaps for those at Charterhall, but they were not to be devoid of their own special breed of aircraft. The main runway looking south. The night of May 27th – 28th 1944 was a heavy night for Bomber Command, with large numbers of four engined heavies attacking targets in Germany. On their return, ten Lancaster bombers were diverted to Charterhall, the first time the four engined bombers would use the airfield, but not the last. On the 8th June, another seven were to arrive, also diverted on their return from the continent. Then in July, a Halifax was diverted here after sustaining heavy flak damage over Helioland. The pilot, P/O W. Stewart of the RCAF and navigator P/O K. Evans (RAF) were both awarded DFCs for their action whilst badly injured, such was the determination to get all the crew and aircraft back safely. July to October saw an increase in flying and an increase in accidents. July ‘led the way’ with heavy landings, burst tyres, ground collisions and engine failures being common place. The majority of these incidents were Beaufighter MKIIfs, some were visiting or passing aircraft who suffered problems and had to divert. Charterhall saw a mix of Lysanders, Barracuders, Beauforts, Wellingtons and Hurricanes all use Charterhall as a safe haven. As the threat of attack was now diminishing, a reorganisation of the O.T.Us would see 9 Group disband in September that year. The responsibility of 54 O.T.U (now flying mainly Mosquitoes) and Charterhall would now pass to 12 Group. Eventually 1944 turned to 1945 and the year that saw for 17 fatal crashes also saw 54 O.T.U. take on more aircraft and more crews. January 1945 was incredibly harsh in terms of weather and the cold. Training new crews on new radar meant that Wellingtons were brought into Charterhall. Small teams of pupils would take turns to operate the radar to detect Hurricane ‘targets’. These new models increased the air frame numbers at Charterhall to 123 by the end of January. ‘No. 1’ Building on the Technical site. By now the allies were winding their way into Germany, pressure was increased by Bomber Command and so more heavies were to find Charterhall a refuge when the weather closed in. 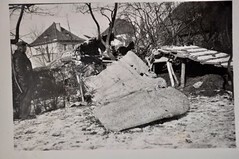 On the 15th February a large ‘Gardening’ operation led to 12 heavies landing at Charterhall along with four Mosquitoes who had been flying with them over Norway. All these aircraft were able to return to their various bases at Skipton-On-Swale, Leeming and Little Snoring the next day. Two days later, more aircraft were to find Charterhall (and Winfield) needed. Some 266 aircrews – an incredible influx for one night – were going to need bedding – billiard tables, sofas and chairs suddenly became in very short supply. The poor weather continued well into the year and snow caused some ‘minor’ accidents at Charterhall. The first confirmed death was not until early March and others were to follow. By May the war had come to an end and operations began to wind down. Winfield was closed and crews returned to Charterhall. Beaufighters were gradually sold, scrapped or moved elsewhere, and by August the last aircraft had left. March would see the last fatalities at Charterhall, both in Mosquitoes on the 25th and 29th. 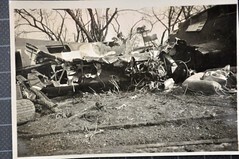 In the former, the aircraft was in a high-speed vertical crash and the latter the pilot, Flight Lieutenant Cole (s/n125484), overshot the runway and crashed his Mosquito FBVI (HR297) a mile south of the airfield. He was 22. Apart from a small detachment of crews from 770 Squadron Naval Air Branch carrying out trials, operations began slowing down. After VJ day, the Mosquito numbers were also wound down, only fifty-one aircraft remained by the end of August. In September the order came through to vacate Charterhall and the packing began. By the end of the month 54 O.T.U. had all but vacated leaving Charterhall quiet once more. The last eighty aircraft consisting of: Mosquito VI, XVII and NF30s, Martinets, an Oxford, Miles Master II, Ansons, Hurricane IICs and Wellington XVIIIs were flown out for the final time, 54 O.T.U. had played its part and their end lay ahead. In the three years that Charterhall had been in operation, they had passed over 800 crews for night fighter operations, they had suffered over 330 accidents, 56 of which had resulted in deaths. During this time crews had flown just short of 92, 000 hours flying time day and night, with almost a third being carried out at night. Had it not been for this unit, the heavy bombers of Bomber Command may well have suffered even greater losses, the determined and deadly night fighters of the Luftwaffe may have had a much wider and easier reign over our skies and the losses we quote today would be even higher. But the withdrawal of 54 O.T.U. was not the demise of Charterhall. For a short period it was set up as No 3 Armament Practice Station, designed to support and train fighter pilots in the art of gunnery. During its period here November 1945 – March 1947 it would see a range of aircraft types grace the runways of Charterhall. The first units were the Spitfire IXB of 130 squadron from December 1st 1945 – January 24th 1946, followed by 165 Squadron’s Spitfire IXE between 30th December and January 24th 1946. On the day these two squadrons moved out, Charterhall entered a new era as the jet engines of Meteor F3s arrived under the command of 263 Squadron. After staying for one month they left, allowing the Mustang IVs of 303 (Polish) Squadron to utilise the airfield. Each of these squadrons followed a course which included air-to-air target practice, ground attack, bombing and dive bombing techniques. Following the completion of the course 303 pulled out and the order was given to close No. 3 Armament Practice Station and wind Charterhall down for good. The RAF sent no further flying units here and apart from a detachment of Mosquitoes from 772 Squadron of the Fleet Air Arm, by the following summer, it had closed. The final spin of the airscrew had taken place. Post war, the airfield was left, the runways and buildings remained intact and the airfield was used by small light aircraft. Gradually though it fell into disrepair, used mainly for agriculture, it had a new lease of life when on Saturday May 31st, 1952, the airfield saw its first motor race using sections of the perimeter track and runways. A two-mile track became the proving ground for a number of the worlds most famous racing drivers including: Sir Stirling Moss, Jackie Stewart O.B.E., Roy Salvadori, Sir John Arthur ‘Jack’ Brabham, AO, OBE, Giuseppe “Nino” Farina and local boy Jim Clark O.B.E. Clark cut his racing teeth at Charterhall, eventually winning 25 Grand Prix races and the Indianapolis 500 in 1965. His grave lies in nearby Chirnside cemetery alongside his mother and father. Charterhall also saw the appearance of Scotland’s first organised sports car team, ‘Ecurie Ecosse’, using Jaguar cars*4. Racing occurred here until 1969, when the current owners took over the site. The RAF then returned briefly in late 1976 undertaking trials of the Rapier ground-to-air missile system, in which a range of fast jets including Jaguars and Phantoms would participate. These lasted a month which would see the last and final RAF involvement end. 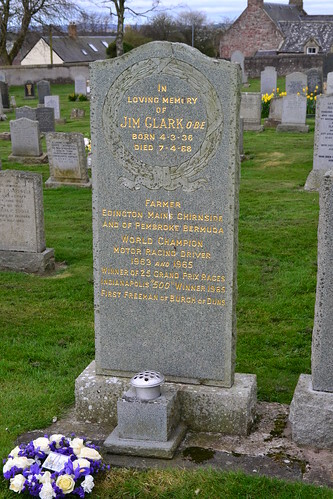 Jim Clark’s grave stone at Chirnside. Today a section at the western end of the main runway is still available for use by light aircraft (with prior permission) and the main technical area is home to the Co-op Grain store, a facility which has a number of large stores for drying and storage of grain. 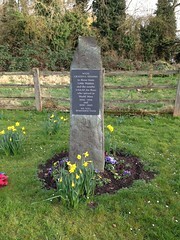 Accessing the site is from the B6460 where a memorial stands to the crews who passed through Charterhall and in particular Flight Lieutenant Hillary and Flight Sgt. Fison, who died in such tragic circumstances. A track leads all the way to the airfield site, which was the main entrance to the airfield. A good quantity of buildings still stand here on the technical site along with two of the original hangars. 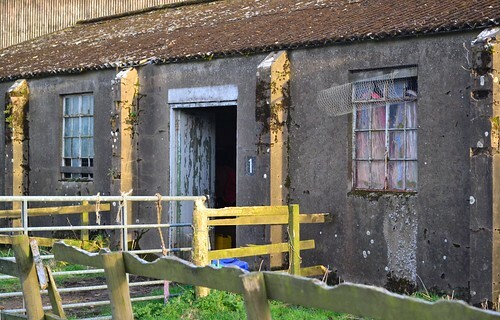 All of these are used for storage or stabling of animals including horses and are rather rundown. The perimeter track and runways are complete but their surfaces are breaking up and in a poor state of repair. 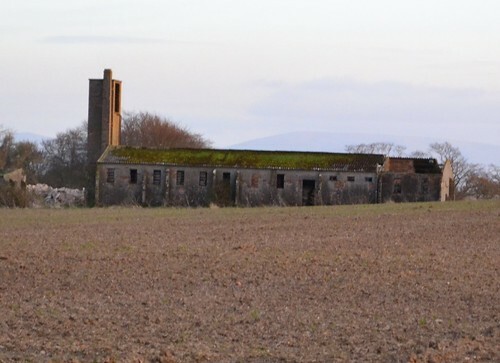 These buildings are a remarkable and poignant reminder of the tragic but significant years that Charterhall prepared and developed crews for the night fighter squadrons of the RAF. Hundreds passed through here, for many it was a difficult twelve weeks, for some it ended abruptly and decisively. Not known for its comforts, it was a pivotal station in the Second World War and indeed also for many years after for the those who went on to become some of the world’s most famous motor racing drivers. Many airmen came and stayed, sixteen of them who were killed on active service whilst at Charterhall are buried in the nearby cemetery at Fogo, a short distance to the north of the airfield. Many are from around the commonwealth who came here to help and were never to return. After leaving Charterhall, we head a little further east to Charterhall’s satellite and a site that had strong links with the forces of Poland. Remembered here is an usual mascot, a bear known as ‘Wojtek’. We stop off a few miles away at the satellite that was RAF Winfield. RAF Winfield, located a few miles east of Charterhall, was pivotal to the success of the night-fighter training programme and in particular to Charterhall and 54 Operational Training Unit (O.T.U.). Charterhall and Winfield cannot be talked about with great reference to each other, they were built together, manned together and operated as part of the same training programme. Winfield and Charterhall probably operated together more closely than any parent / satellite airfields of the Second World War. Winfield Watch Office one of the few remaining buildings now derelict and forlorn. Winfield (like Charterhall) was initially used as a First World War landing ground for 77 Sqn based at Edinburgh flying a range of Royal Aircraft Factory B.E. types in the Home Defence role. Whilst many of these airfields were designated ‘landing grounds’, many were not officially recorded to the point that their precise locations remain vague even today. Winfield (or Horndean as it was known), was designed as a site where crews could land in an emergency, perhaps if their aircraft developed problems or if weather prevented landing at their home station. 77 Sqn were part of a force who were to patrol the eastern regions of Britain, an area stretching from Dover in the south to Edinburgh in the north. This area, was the furthest point north and the defence of the Scottish border region fell to 77 Sqn. The conditions at Horndean were not luxury, and the ‘runways’ were far from smooth, but in an emergency any semi-decent ground was most likely welcome. Crews often practised emergency landings at both Horndean and Eccles Toft (Charterhall), where aircraft guards would restart the aircraft before flight could take place again. These ‘guards’ (or Ack Emas as they were known) were often mechanics recruited into the Royal Flying Corps because of their mechanical background and knowledge of engines. 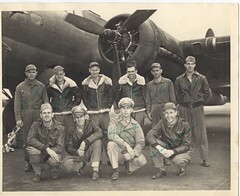 After a brief training period of some eight weeks, they were sent to various establishments to maintain and prepare aircraft before and after flight. Horndean as an airfield was not to last though, and before the war’s end it would close returning to its former agricultural use. With the outbreak of the Second World War, the training of pilots and other crewmen became a priority. Night fighters were also needed and Winfield would fulfil this role. Winfield was built over the period 1941 – 42 opening later than expected, due to bad weather, in April 1942. A rather hastily affair, it was built between two roads and would only have two runways. Oddly, the initial construction of the runway was by hand, red shale from local quarries being brought in by endless lorries and laid down by local workers. It didn’t take long though before it was realised that this method was too slow, and so heavy machinery was brought in, and the stocks of shale bulldozed into the foundations. At the threshold, rubble stone was laid to a depth of some 12 feet, much deeper than the remainder, to take the impact of landing aircraft. A covering of tarmac was laid over this layer in depths of between four and six inches thick. 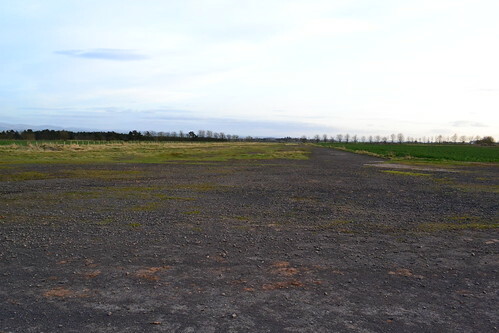 The runways at Winfield, like Charterhall, were 1,600 and 1,100 yards and both 50 yards wide. Aircraft dispersal was provided by thirty-seven hardstands whilst maintenance was carried out in four blister hangars. The first personnel to arrive were an advanced party of thirty-four airmen led by Flying Officer Beal, who arrived on April 30th 1942. Unlike Charterhall, the airfield was complete and ready for the new recruits to move straight in. Being a satellite station, accommodation numbers catered for were less than those at Charterhall, 686 airmen and 56 WAAFs, all spread over five sites: three airmen, a WAAF, and a communal site. A small sewage plant was located not far from these, all to the north-eastern side of the airfield. Trainees were to follow an initial three-tier programme. Starting in ‘A’ squadron – the conversion unit – they would then pass to ‘B’ and then finally onto ‘C’ here at Winfield. C Squadron, would finely tune skills and train aircrew in uses of Aircraft Interception (AI), ground attack and air-to-air gunnery techniques. Later on, a fourth tier would be added, focusing purely in flying the D.H. Mosquito in the night fighter role. 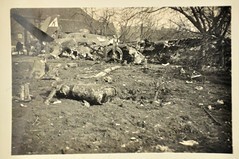 Remains of the former WAAF site. These initial stages primarily used Beaufighters and Blenheims, aircraft that had been passed down from front line units to the training squadrons of the O.T.U.s. Many were therefore ‘war weary’ and as a result, mechanical problems were common place. The first fatality at Winfield occurred in a rather bizarre accident on May 23rd 1942. A dispatch rider, Aircraftman 1st Class, John R. Livesey (s/n1478277), was struck by a Blenheim flown by Sgt. J. Grundy as the aircraft was taking off. The aircraft was damaged in the collision and the pilot unhurt, but Livesey was very sadly killed; he now rests at Marton (St. Paul) church in Blackpool. In August 1942 a combined operation was planned involving Spitfire VBs from 222 Sqn (based at North Weald) and Boston IIIs from Attlebridge’s 88 Sqn. These manoeuvres saw eighteen Spitfires and twelve Bostons arrive, supported by three H.P. Harrows of 271 Sqn bringing ground crews, spares and supplies for the various aircraft. In all, around 360 new crews were accommodated at Winfield over the short two-week period. Adept at low-level attacks, the two squadrons would arrive here between 1st and 4th August 1942, spend several days attacking ‘enemy’ transport and troop routes across southern Scotland, before departing. Considered a relative success, their stay was only for a short period vacating to RAF airfields at Drem, near Edinburgh, and Attlebridge, in Norfolk, respectively by mid August. A further deployment of Mustang Is of 241 Sqn based at Ayr was cut short when bad weather prevented both flying and training operations from occurring. Later that month the small party left rather disappointed having hardly flown since arriving here at Winfield. Being the more advanced tier of the training programme, serious accidents at Winfield occurred less frequently than at Charterhall. Burst tyres and mechanical problems being the main cause of many of the problems that were incurred. 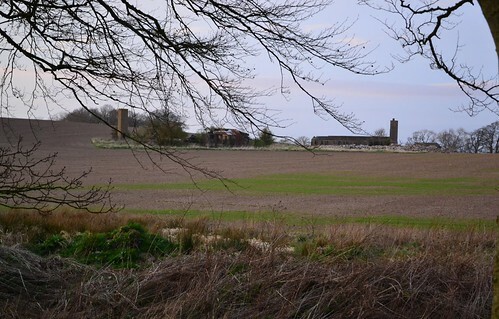 Few buildings remain at Winfield, the WAAF site having the majority of the examples. During July 1943, a Beaufighter from ‘C’ Squadron at Winfield misjudged the distance from himself to the target drogue being pulled by a Lysander, after firing and passing, his airscrew caught the drogue’s wire; luckily both aircraft were able to land safely and neither crew were injured. At the end of July a less fortunate incident occurred when, on a night flight, the port engine of Beaufighter T3370 (a former 456 Sqn RAAF aircraft coded RX-Z) caught fire. The crew bailed out, the pilot surviving but the Radio operator/navigator P/O. Frank Walmsley (s/n J/17124) of the RCAF was posted missing, presumed drowned, after the aircraft crashed into the sea. No trace was ever found of him. October saw further deaths of crews from Winfield. On the 11th, Beaufighter VI, (ND184) crashed killing its Pilot Sgt. Angus Taylor, after it suffered engine failure; followed the next day by the crash of Beaufighter T3218 in a gunnery exercise over the North Sea. The aircraft crashed into the water after incurring a stall, both crewmen; F/O. John W. Roussel and F/O. Francis L. Kirkwood both of the RCAF, were missing presumed drowned. Both are commemorated on the Runnymede memorial. During 1944 the tide began to turn and night fighter crews were on the offensive. The invasion of Normandy brought new hope and a new aircraft – the Mosquito. But as 1944 ended it would be the worst for fatalities in 54 OTU. 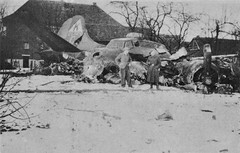 January brought many heavy bombers to the grounds of Winfield, returning from missions over Europe, they were either damaged or unable to land at their own respective bases due to poor weather. On February 17th 1945, fourteen Halifax IIIs from 420 Squadron RCAF landed at Winfield along with a further 408 Squadron aircraft. Whilst not able to comfortably accommodate such numbers and aircraft, it would have no doubt been a happy, and very much appreciated landing. As the war drew to a close so did the number of flying hours. By May 31st the war was over and Winfield was no longer required, all the various ranks were pulled back to Charterhall leaving only a small maintenance party behind. For the next few years Winfield would have no operational units stay here, either temporary or permanently. At the end of the war many Polish units and displaced persons were pulled back to the U.K. in preparation for their repatriation into civilian life and for some return to their native country. Winfield became the site of one such group; the 22 Artillery Support Company (Army Service Corps, 2nd Polish Corps) who whilst fighting in the Middle East and Italy adopted a rather odd mascot. 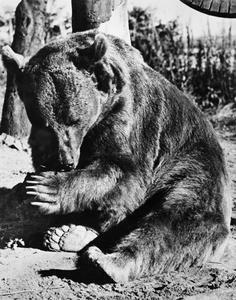 He became known as Wojtek, a Syrian bear who was officially given the rank of Private in the Polish Army, and who ‘fought’ alongside them as one of their own. After finding the bear as a young cub wrapped around the neck of a small Iranian boy, Lance Corporal Peter Prendys took him and adopted him. After the war, on October 28th 1946, the Polish Army along with the bear arrived at Winfield Displaced Persons Camp – little did they know what a stir Wojtek would cause. As displaced persons the Polish men would venture into nearby Berwick, where the locals grew fond of them and drinks flowed in abundance. Wojtek would go with them, becoming a familiar, if not unorthodox, site amongst the streets and bars or Berwick. This cigarette smoking, beer loving character, often causing a stir wherever he went. He became renowned in the area, the local villagers would flock to see him. He joined in with the frolics and loved the life that he was being allowed to live. As a bear he loved the rivers and the River Tweed flows only a short distance from Winfield, rich and fast flowing it is abundant in that other commodity – Salmon. However, Wojtek was under strict orders not to swim alone nor stray onto the airfield which although closed, could still provide a danger for him if seen. Wojtek became part of local history, eventually, a year after their arrival, the Polish unit were demobbed and they moved away. Wojtek was given to Edinburgh Zoo to look after, who did so until his death at the age of 21 in 1963. A statue stands in Princess Street Gardens beneath Edinburgh Castle as a reminder of both him and the Polish troops who were stationed at Winfield camp. 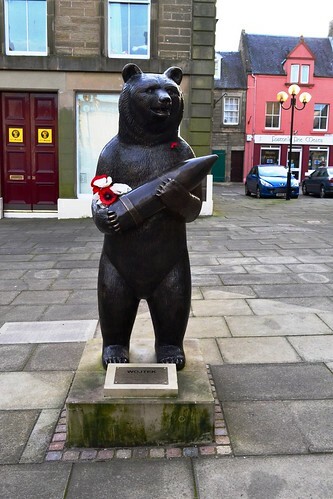 A second statue of Wojtek stands in the centre of Duns, the village not far from Charterhall. The Wojtek Memorial Trust, set up in his honour, aims to promote both educational and friendship links between the young people of Scotland and Poland, an aim it tirelessly works towards today. Statue of Wojtek in the centre of nearby Duns. After the Polish troops left, Winfield was allocated to the USAF, and earmarked for development, but this never materialised and the site was left dormant. Winfield then reverted back to RAF control some five years later in October 1955, whereupon it was disposed of and sold off. A small group of private flyers reopened the site, renovating the watch office and utilising a small hangar on the north of the airfield. This operation has now ceased and the watch office has sadly fallen into disrepair, it windows missing and open to the elements. The demise of Winfield and its subsequent decay has begun. Winfield airfield lies between two roads, a further public road passes through the site although this was seen to be gated at the southern end. The most prominent feature is by far the Watch Office, a two-story design built to design 15684/41, having walls some 13.5 inches thick as was standard for all night-fighter stations (but different to the one at Charterhall). 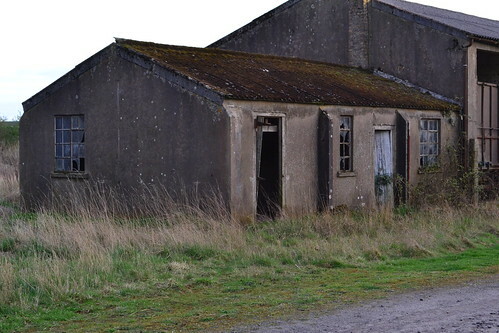 Other buildings also remain to the west on the main airfield site but these are only small and very few in number. 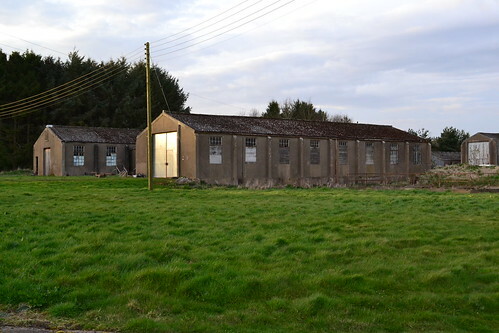 The accommodation sites have all been removed, however, there are some buildings remaining in the former WAAF site to the north of the airfield. 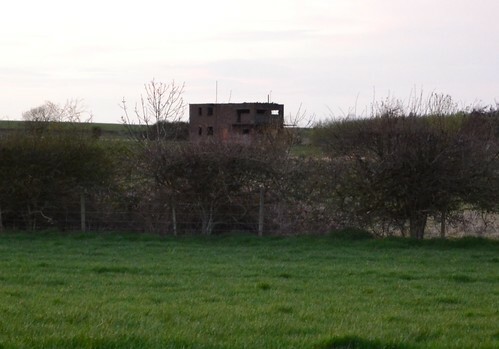 Located down a track just off the B4640, these buildings appear to be latrines and a possible WAAF decontamination block, with other partial remains nearby. Drawing numbers for these are unclear, (but appear to be 14420/41 and 14353/41) indicating WAAF (Officer and sergeant) quarters. Other buildings on this site look to have been a drying room, water storage tank and a picket post. Heading further south along this track leads to a small pond, here is a local design Fire Trailer shelter: a small brick-built building no more than about seven feet square. 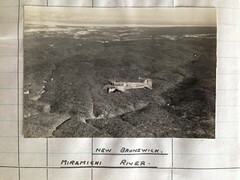 Presumably this pond was used to fill the fire trailer in cases of fire or attack and was located midway between the WAAF site and the main airfield. Also on this site, which is part of the Displaced Persons Camp, is a makeshift memorial to the Polish Armed Forces, dotted around the ground are a number of metal parts partially buried in the soil. 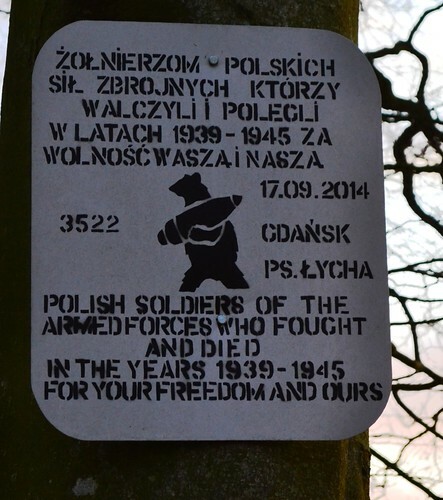 A plaque dedicated to the Polish Armed Forces placed next to the fire trailer hut. The airfield runways and perimeter tracks are still in place, and years of both decay and locals using them to practice their driving skills on, have taken their toll. Like Charterhall, Winfield was also used as a motor racing circuit, although not to the same extent that Charterhall was. On one occasion though, as many as 50,000 spectators were known to have visited the site on one day alone! Winfield like its parent site has now become history, the remnants of its past linger on as final reminders of the activities that went on here in the 1940s. The night fighter pilots who pushed the boundaries of aircraft location and interception are gradually fading away; the dilapidated buildings too are gradually crumbling and breaking apart. Inch by inch these sites are disappearing until one day soon, perhaps even they will have gone along with the brave young men who came here to train, to fight and in many cases to die. As we leave the remnants of Winfield and Charterhall behind, we continue North to our next trail; nearing Edinburgh we take in more of Scotland’s natural beauty and even more tales of its wonderful but tragic aviation history. My sincere thanks go to both Mr. and Mrs. Campbell for their hospitality and the help in touring these two sites. *1 An interview with Edward Braine, in ‘reel 4’ he describes his posting to RAF Charterhall for operational training; crewing up; transfer onto Bristol Beaufighters; position of navigator in Bristol Beaufighter; accident during training; method of observing aircraft at night and interpreting radar signals. Sound file reel 4 Recorded and presented by the Imperial War Museum. *2 News report on Hillary in ‘The Scotsman‘ Newspaper, 11th November 2001. *3 Commonwealth War Graves Commission website accessed 29/4/17. *4 Obituary of Bill Dobson: ‘Ecurie Ecosse’ racing driver in ‘The Scotsman‘ newspaper 21st October 2008. *5 A news report of the event can be read on ‘The Berwickshire News‘ Newspaper, 28th March 2013. *1 Photo IWM collections No.HU 16548. The Polish Scottish Heritage website provides information about the scheme.